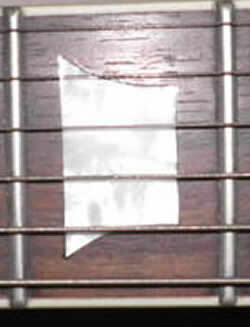 The standard stock Epihone fretboard inlays are cheap very thin plastic and a slightly different shape to Gibson USA models. If you are upgrading your Epi LP or ES/ SG it is a relatively easy operation to fit cellulose nitrate inlays as fitted to original 50's Gibsons and the Gibson Custom Shop Historic reissues. This is the board with the strings removed. 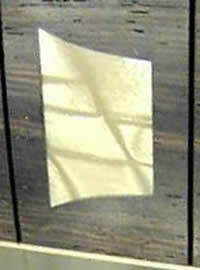 You will note that the Epi inlays are slightly nore concave at the centre edges than the Gibson shape. Although the replacements are the same size from top to bottom you will need to very slightly straighten the outer edges. Tape up the board as above. Drill a small hole in the centre of the inlay. Drill deep enough until you hit wood.Using a hairdrier ( a heatgun maybe too gierce and melt the binding) heat the inlay until it's soft, keeping the heat on use a small screwdriver (some recommend a corkscrew) inserted in the drill hole gently lift out the inlay. If you're lucky it will come out whole but most likely it will be in chunks. Once removed You will need to tidy up the route edges, I used a Dremmel but if your very adept and own a set of very sharp chisels you could do it freehand. The Rpi inlays are very thin compared with the replacements so they will sit proud and need to be scraped down level. If I'd realised how long this would take I would have deepened the pockets. 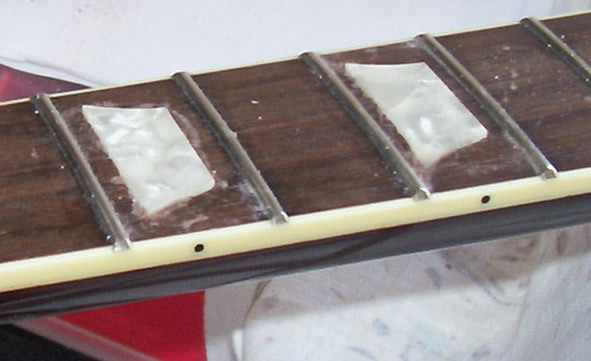 Just use CA glue to adhere the new inlays. Shown below is how thick the new inlays are. Using a sharp blade, scraple the inlay until level with the fret board and using fine sand paper around a wooden block sand to the fingerboard radius. Sand along the baord with the grain. Once sanded flat run CA glue around the edges of each inlay, leave for 24 hours then sand off Once flat start sanding with fineer grades of paper. At this stage you can liberally apply lemmon or Trueoil to the board. This will show up any defects or blemeshes, if so rub down and re-oil leaving 24 hours in between. When you are finally happy finish with 0000 guage wire wool then re-oil. WARNING. If your pickups are fitted then completely mask them with tape otherwise you will have tiny bits of wire wool in them forever!